What the Hell did Qyburn do to The Mountain that made him so strong? He’s basically a horror movie villain now. I’m glad Jaime let Brienne keep Oathkeeper. She’ll probably put it to better use than he would, anyway. Tommen went from being under Cersei’s thumb to being under Margaery’s and now he’s under the High Sparrow’s. Whereas no one could control Joffrey, Tommen is far too easily manipulated. The scene with Tyrion explaining jokes to Missandei and Grey Worm makes me laugh. I’m glad the writers know how to include some humorous moments on this show. With Jaime it really is two steps forward, one step back. Just when I start to think he’s becoming a decent guy, he threatens to commit infanticide. If I were Daenerys and I came back to see my city being attacked I’d be so pissed. I’m really looking forward to watching The Hound and the Brotherhood Without Banners fight some White Walkers. I think that the Waif became a Faceless Man because she enjoyed killing. She was almost as sadistic as Myranda and Ramsay, judging from the way she killed Lady Crane. At least all that time Arya spent without her eyesight finally paid off. “A girl is Arya Stark of Winterfell. 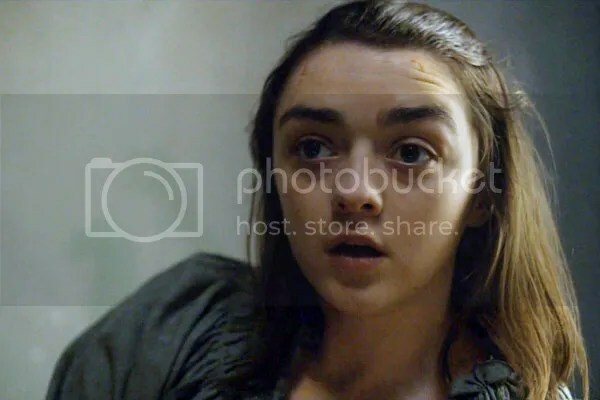 And I’m going home.” – You tell him, Arya! This entry was posted in game of thrones, television and tagged game of thrones. Bookmark the permalink.